Jharkhand Board JAC 12th Toppers: This year, around 4 lakh students appeared for the class 12 exams across the Jharkhand state. The Jharkhand Academic Council (JAC), Ranchi is all set to announce the JAC 12th Results 2018 on June 07, 2018. After the declaration of the results, The board will also release the Toppers list of Jharkhand Board 12th Class Exams regarding Science, Arts, and Commerce streams. 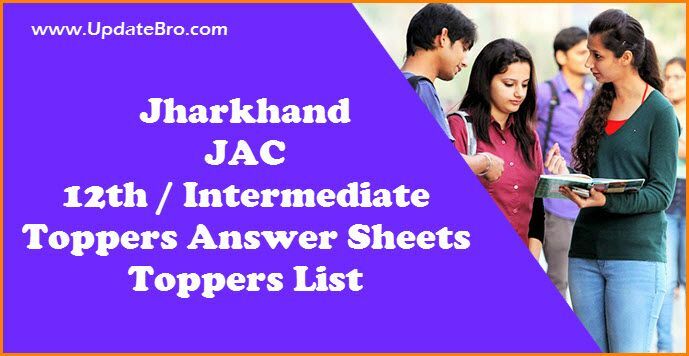 Check out the complete details of JAC Intermediate (12th Class) 2018 Toppers List, Topper Answer Sheet Copies, Science, Arts and Commerce Stream Wise Toppers, Merit List District Wise, Result Analysis, and also check the pass percentage details from the below article. After the declaration of the JAC Class XII results, The board will also release the Merit list of Jharkhand Board 12th (Inter) Exams according to Stream Wise, College Wise, Subject Wise, and District Wise. We will also upload those details whenever the officials have been released. The overall pass percentage was 71.95. The pass percentage of boys was 69.19 per cent and for girls it was 74.02 per cent. A total of 3,26,107 students had appeared for the Intermediate examination out of which a total of 90,871 were from science stream, 47,622 from commerce while 1,87,610 from arts. This year, 44,677 students have cleared in Science stream drafting a pass percentage of 48.34. This year 16,618 students have secured first division in Science strea,, 26,337- second division, 1,711- third division. In 2017, the total number of candidates who appeared for the exam was 4.7 lakh students. Out of which the total number of passed students were 317655. Overall pass percentage recorded was 67.54 percent. The pass percentage in the Intermediate (Science) in previous year stood at 58.36 percent. The board will also release the top three students answer sheet copies to the public on their website. We will also update those links on this page whenever the officials have been released. Meanwhile, you can check the previous year toppers list and their answer sheet copies from the below link. 1st topper answer sheets are not available.